About Us | Desert Dream Realty Cave Creek | 480-252-8300 | Find Your Dream Home with Us! Desert Dream Realty is Cave Creek's top producing real estate brokerage. Our dedicated, educated and experienced realtors can help you whether you are buying or selling your home throughout the Valley of the Sun. 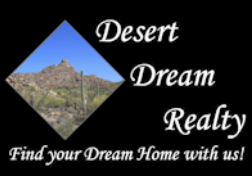 Desert Dream Realty has top producing agents specializing in homes for sale including but not limited to Cave Creek, Scottsdale, Phoenix, Anthem, Carefree, Paradise Valley, Glendale, Avondale, Chandler, New River, Desert Hills, Fountain Hills and Black Canyon City. We can help you with bank owned, short sales and regular sales. Experience the difference working with our Realtors at Desert Dream Realty. Find your DREAM HOME with Us! To provide fair and equal opportunities for everyone to obtain the American Dream of Homeownership. Providing dedicated and ethical standards, commitment and professionalism to each and every person we have the honor of working with. We promise to work with each individual and family with every resource to assist them with their goals and to achieve the absolute best for their future. The fact is, there isn't much more to the average agent than the agent themselves. Most agents operate a one-person show - and they're probably breaking their backs trying to do a good job for their clients. Most agents couldn't really work any harder than they're already working. We know, because we used to do it this way. But we don't anymore because we found that our clients suffered from our good intentions. The fact is, you may be sympathetic to the fact that your agent is working as hard as humanly possible, but if the quality and profitability of your home sale suffers as a result, you have a right to feel cheated. The simple solution to this problem is that we built a team of real estate professionals to help us be in 10 places at once. This greatly enhances the quality and delivery time of service we can provide to our clients. On top of this, we've used cutting edge technology to dramatically improve the speed, efficiency and innovative capabilities of every part of the service we deliver. We don't expect you to care about the finer details of the inner-workings of our office. What you should care about is simply this - Because of the unique way we've structured our real estate office . . . Dedicated, Educated and Experienced Realtors at DESERT DREAM REALTY! Dedicated, Educated and Experienced Top Producing Agents fulfilling your dreams one home at a time! Find your DREAM HOME with Us!